NOTE: This web page discusses an older version of LITMUSRT. Please use the current version unless you have specific interest in the 2008 series. Earlier versions (2007.1 — 2007.3), which are based on Linux 2.6.20 and support additional scheduling policies, are discussed on a separate page dedicated to the LITMUSRT 2007 series. 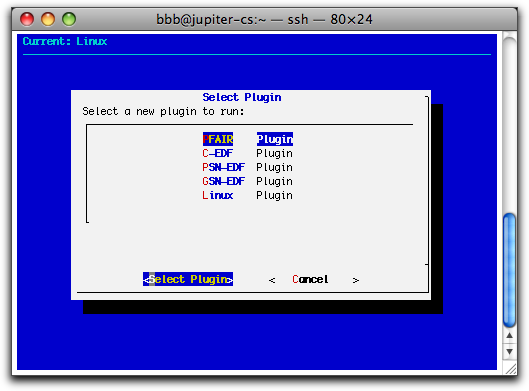 The first version of LITMUSRT, which was implemented in Spring 2006, is based on Linux 2.6.9. Re-basing to the then-current Linux kernel version is scheduled for Spring 2010. There are plans to port LITMUSRT to PowerPC and ARM platforms. Please contact us for details. The LITMUSRT development effort is being supported by grants from, SUN Corp., Intel Corp., IBM Corp., The National Science Foundation (grant CCR 0615197), and The U.S. Army Research Office (grant W911NF-06-1-0425). B. Brandenburg and J. Anderson “Reader-Writer Synchronization for Shared-Memory Multiprocessor Real-Time Systems”, Proceedings of the 21st Euromicro Conference on Real-Time Systems , pp. 184-193, July 2009. Postscript. PDF. Long version with blocking terms: Postscript. PDF. J. Calandrino and J. Anderson “On the Design and Implementation of a Cache-Aware Multicore Real-Time Scheduler”, Proceedings of the 21st Euromicro Conference on Real-Time Systems , pp. 194-204, July 2009. Postscript. PDF. M. Mollison, B. Brandenburg, and J. Anderson “Towards Unit Testing Real-Time Schedulers in LITMUSRT”, Proceedings of the Fifth International Workshop on Operating Systems Platforms for Embedded Real-Time Applications , pp. 33-39, July 2009. Postscript. PDF. B. Brandenburg and J. Anderson, “A Comparison of the M-PCP, D-PCP, and FMLP on LITMUSRT”, Proceedings of the 12th International Conference on Principles of Distributed Systems , pp. 105-124, December 2008. Postscript. PDF. B. Brandenburg and J. Anderson, “An Implementation of the PCP, SRP, D-PCP, M-PCP, and FMLP Real-Time Synchronization Protocols in LITMUSRT”, Proceedings of the 14th IEEE International Conference on Embedded and Real-Time Computing Systems and Applications , pp. 185-194, August 2008. Postscript. PDF. A. Block, B. Brandenburg, J. Anderson, and S. Quint, “An Adaptive Framework for Multiprocessor Real-Time Systems”, Proceedings of the 20th Euromicro Conference on Real-Time Systems , pp. 23-33, July 2008. Postscript. PDF. B. Brandenburg, J. Calandrino, A. Block, H. Leontyev, and J. Anderson, “Real-Time Synchronization on Multiprocessors: To Block or Not to Block, to Suspend or Spin?”, Proceedings of the 14th IEEE Real-Time and Embedded Technology and Applications Symposium , pp. 342-353, April 2008. Postscript. PDF. Extended version, including all graphs: Postscript, PDF. B. Brandenburg, A. Block, J. Calandrino, U. Devi, H. Leontyev, and J. Anderson, "LITMUSRT: A Status Report", Proceedings of the 9th Real-Time Linux Workshop , pp. 107-123, November 2007. Postscript. PDF. B. Brandenburg and J. Anderson, "Integrating Hard/Soft Real-Time Tasks and Best-Effort Jobs on Multiprocessors", Proceedings of the 19th Euromicro Conference on Real-Time Systems , pp. 61-70, July 2007. Postscript, PDF. J. Calandrino, H. Leontyev, A. Block, U. Devi, and J. Anderson, "LITMUSRT: A Testbed for Empirically Comparing Real-Time Multiprocessor Schedulers ", Proceedings of the 27th IEEE Real-Time Systems Symposium , pp. 111-123, December 2006. Postscript, PDF. The current release of LITMUSRT is 2008.3. It consists of our Linux kernel modifications in the form of a patch against Linux 2.6.24 and liblitmus, the user-space API for real-time tasks, as well as ft_tools, a collection of tools used for tracing with Feather-Trace (which is part of the LITMUSRT patch). Based on Linux 2.6.24. Released in September 2009.
sys_null_call(), a dummy system call that simplifies determining system call overheads. Support for starting timers on remote CPUs via hrtimer_start_on(). Support for dedicated release handling in GSN-EDF and a corresponding /proc interface. Support for IPI latency tracing. Switched to scons as build system in libraries. Support for cross compiling the libraries on x86-64 systems to i386 binaries (specify ARCH=i386 in your environment). Please consult the Change Log for further details. Based on Linux 2.6.24. Released in December 2008. PFAIR implementation can now recover from missed tick interrupts. A bug in the PFAIR prioritization function was corrected. Support for synchronous task system releases in the EDF-based schedulers was fixed. sched_trace() support was re-implemented based on Feather-Trace. Added the tool showst to liblitmus, which can convert sched_trace() binary data to a human-readable format. Based on Linux 2.6.24. Released in July 2008. LITMUSRT was ported to Linux 2.6.24. LITMUSRT was ported to sparc64. LITMUSRT is now a proper scheduling class (SCHED_LITMUS). LITMUSRT queues are now based on mergeable heaps. Support for multi-threaded real-time tasks. Scheduler plugins can be selected at runtime; no reboot required. Older releases: LITMUSRT 2007 series. The current release of LITMUSRT consists of an extension of the Linux kernel that adds support for the sporadic task model, a scheduler plugin infrastructure, and some scheduler plugins, as well as a user-space library that provides the LITMUSRT real-time API. Note that the current implementation only works on the Intel x86-32 and sparc64 architectures. When configuring the kernel, note that there is a menu (at the very end of the list) with LITMUSRT-specific configuration options. For reference, we provide a configuration that is known to work under QEMU. The user-space library for real-time tasks, liblitmus, depends on the LITMUSRT kernel kernel and provides its own build system (based on scons). In order to compile liblitmus, you need to adjust the variable LITMUS_KERNEL in the SConstruct file to point to your copy of the kernel. The user space library that provides the LITMUSRT API, liblitmus, contains two example real-time tasks (base_task.c and base_mt_task.c) that both illustrate how to use the API and provide a skeleton for real-time task development. To get started with development, please take a look these example programs.